A few more meters away, on the same stroll, we came across incredibly prolific grape vines growing out of someone’s back yard. There were bunches and bunches of young fruit, and I am not sure if these were table grapes but they sure looked good to me! With such healthy plants and foliage, I can see why grape leaves are a big ingredient in Greek cooking, used to wrap up meats and rice and for other such recipes. hi, MM..i may be jaded in a lot of ways, but i’m like you when it comes to berries and fruits ”on the sidewalk”.. ripening fruits dipping on the sidewalks (outside property line) are fair game to me. 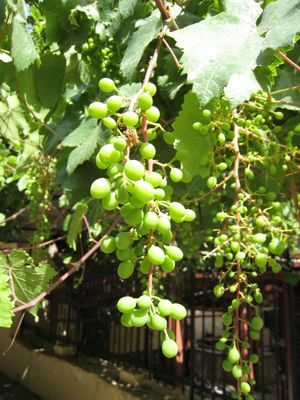 grapes on vines are more tempting to pick than the ones in the grocery..berries are now very much in season in the northeast. 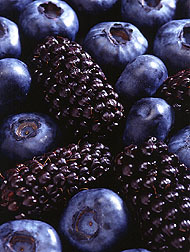 they are now a bit expensive since they have gained popularity as rich sources of antioxidants. i love making blackberry jam and giving it out as gifts to my friends…. Maybe it would not have been too obvious if you swiped a few of the grape leaves to make dolma. My sister just dropped off bottles of blackberry preserves! seriously though, i love love love your blog! i get to ‘see’ the world through your eyes. my heartfelt thank you for sharing, dear MM. keep ’em coming! I’m quite impressed with the kid’s charming tastes in foods like blackberries:) My choice of berries are quite selective and boring as compared to the kid’s. I enjoy looking at your photos though, and would probably take pictures myself if I were there. I might be mistaken but could those berries really be mulberries? They grow wild in the city here in the US. You can tell them because they have a rather bothersome stem that grows right through the berry. You can always tell when they’re ready to pick because the sidewalk is always stained below the tree. The berries are also very fragile and turn your fingers blue when you pick them. We try to pick enough for a mulberry parfait pie that I found in a wild cookbook. Please correct me if I’m thinking of another berry altogether. 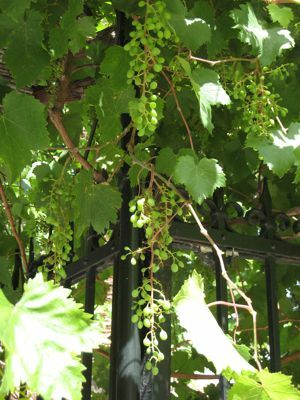 Anyway, the grapes look so pretty hanging there–I bet they taste good! Unfortunately, I have only tasted fresh starwberries, the rest of the berries I tasted (bluberries, raspberries and blackberries) are either canned or preserved. Like Regina, I suspect that these are mulberries. I don’t remember mulberries to have any pits. Right behind the Xavier Hall in Ateneo Loyola is a flourishing and fruiting mulberry tree. In second year, our Biology teacher showed us the tree and proceeded to pick and pop the fruits in her mouth. So it CAN grow and fruit here. For the rest of my years in college, I made sure to sample the fruit when it was in season (August if I am not mistaken.) Like Aggy’s comment, sun ripened is best! My bestfriend I and do the same thing whenever we go on vacation and come across such things…I find it very interesting. So don’t worry MM, you’re not the the only ‘nutcase’ around. No you’re not a nutcase MM. I myself would do the same thing. Thank you for sharing all your wonderful adventures. They are definitely not mulberries. 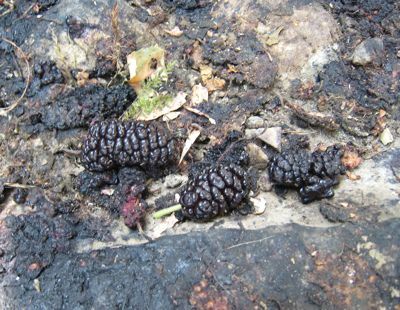 Mulberries look like a miniature bunch of grapes and are red when unripe and turn black. So the song “going round the mulberry bush” is a lie? I will bet a bottle of wine that these are mulberries. Or they could be freakish blackberries. I think they are mulberries too. We had a tree in our old house in Makati. They are sweet when tree-ripened. Their juice leaves nasty stains on clothes and on the sidewalk when they splatter….ah, brings back childhood memories! P.S. – Am a nutcase too! That is so funny that you wrote about berries and grapes, coz in my yard here in massachusetts, blackberries, blueberries and raspberries grow wild, I mean I never planted it, the birds took care of that. The blackberry plants are thorny, the blueberry shrubs are like small trees and the raspberries are just everywhere,wild grapes grow abundantly too, and the fruit never gets bigger than raisin sized, but the taste is so different than table grapes when one drinks grape soda, that’s what it tastes like.. I planted some blue and green grapes, but we never harvested the fruits, they are for the squirrels and chipmunks that reside in my yard, the rabbits cannot reach the fruits, so they just eat the ones that fall on the ground.About this time of the year, the raspberries and blackberries are usually dried up but the grapes and blueberries should be ready by Fall. yup, those do look very much like mulberries. We have a tree at home and I practically grew up munching on those. Mulberry trees are actually very easy to grow in the Philippines. 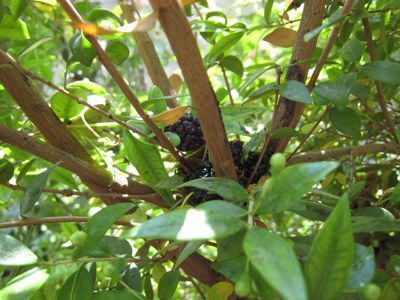 You only need a stick or a branch of the tree and stake it in the ground for it to grow into a fruiting specimen. It’s always fascinating to see produce usually seen only on supermarket shelves either dried or processed very much alive and growing almost wild in a public place. Reminds me of the almond trees I saw along the road in Israel. MM’s photo is definitely Mulberry! my lola had a fruiting mulberry tree in her front yard in iloilo, but i never got to ask about its ‘provenance (lola passed away a few years ago).’ i wonder why it’s not more common, seeing that it does survive and thrive in the tropics. too bad. Can somebody please post a photo of the mulberry tree grown in the Phils? I have a tree in my front yard that bears round purple berries that seriously stains our car when they fall. I don’t know if it’s mulberry but it’s a big tree. From the discussions it sounds like a small tree. Thanks! hello market man, i reside in baguio and there are plenty of blackberry trees around here. but unfortunately the fruits are not populary sold in the market. few years back, i happen to see a boy selling blacberries in the overpass towards the market, and i delightfully bought a kilo of it. my mom combined it with rhubarb to make a jam. and also my siter used it to make muffins replacing the more commone blueberries. i really find them good or even better than the blueberries! now, i wanted to propagate it but i dont know where i can find seedlings that would perhaps produce fruits quickly. can anybody help me. thanks!